The earnings, or lack thereof, put a firm cap on the markets today. 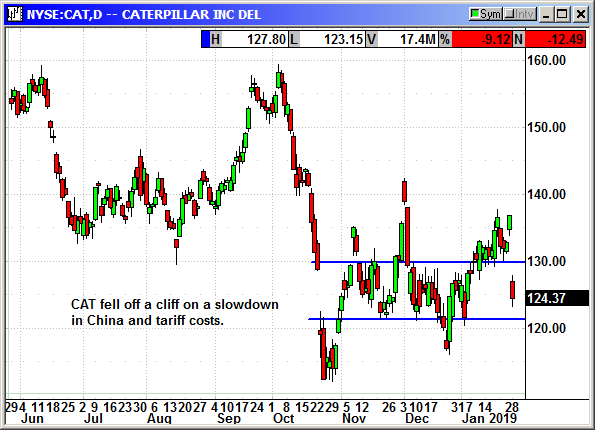 Caterpillar missed. Nvidia issued a major warning and fell 14%. Whirlpool missed on earnings and guided lower for 2019. Shares fell $10 in afterhours. 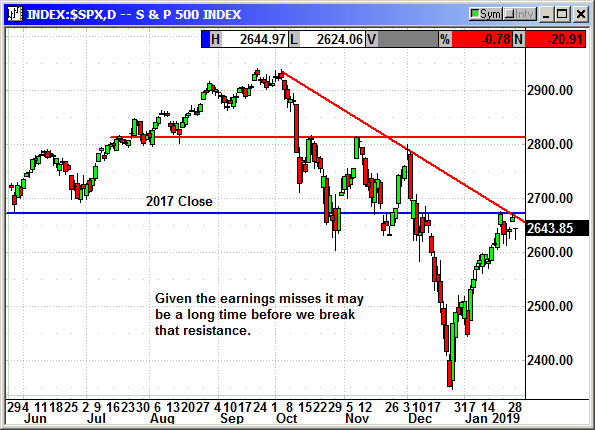 Investors were looking for earnings to lift the market, but it is not working out as expected. We could be headed for some rocky trading in the days ahead. The long position was closed at the open. The long position was stopped at the open. CAT reported earnings of $2.55 that missed estimates for $2.98. That was the biggest quarterly earnings miss in over a decade. However, it was still an improvement from the $2.16 in the year ago quarter. This was the first earnings miss in ten quarters. Revenue of $14.34 billion also missed estimates but was up from $12.90 in the year ago quarter. The guided for 2019 to earnings of $11.75-$12.75 and analysts were expecting $12.73. They blamed a slowdown in China's economy and the trade tariffs for the earnings miss. We were stopped out at the open and CAT closed down $12.49 for the day. 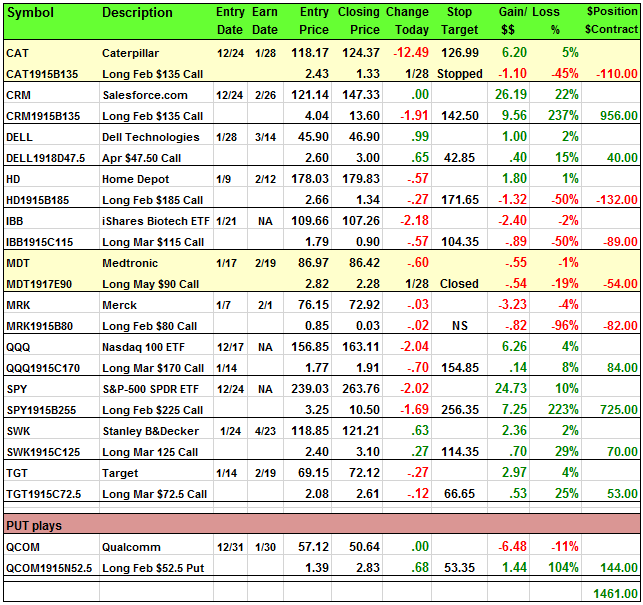 Closed 1/28: Long Feb $135 call @ $2.43, exit $1.33, -1.10 loss. We closed this position at the open because of lack of movement. Medtronic plc develops, manufactures, distributes, and sells device-based medical therapies to hospitals, physicians, clinicians, and patients worldwide. It operates through four segments: Cardiac and Vascular Group, Minimally Invasive Therapies Group, Restorative Therapies Group, and Diabetes Group. The Cardiac and Vascular Group segment offers implantable cardiac pacemakers, cardioverter defibrillators, and cardiac resynchronization therapy devices; AF ablation product; insertable cardiac monitor systems; mechanical circulatory support; TYRX products; and remote monitoring and patient-centered software. It also provides aortic valves; percutaneous coronary intervention stents, surgical valve replacement and repair products, endovascular stent grafts, percutaneous angioplasty balloons, and products to treat superficial venous diseases in the lower extremities. The Minimally Invasive Therapies Group segment offers surgical products, including surgical stapling devices, vessel sealing instruments, wound closure, electrosurgery products, hernia mechanical devices, mesh implants, and gynecology products; hardware instruments and mesh fixation device; and gastrointestinal, inhalation therapy, and renal care solutions. The Restorative Therapies Group segment offers products for spinal surgeons, neurosurgeons, neurologists, pain management specialists, anesthesiologists, orthopedic surgeons, urologists, colorectal surgeons, urogynecologists, interventional radiologists, and ear, nose, and throat specialists; and systems that incorporate energy surgical instruments. It also provides image-guided surgery and intra-operative imaging systems; and therapies for vasculature in and around the brain. The Diabetes Group segment offers insulin pumps and consumables, continuous glucose monitoring systems, and therapy management software. The company was founded in 1949 and is headquartered in Dublin, Ireland. Company description from FinViz.com. 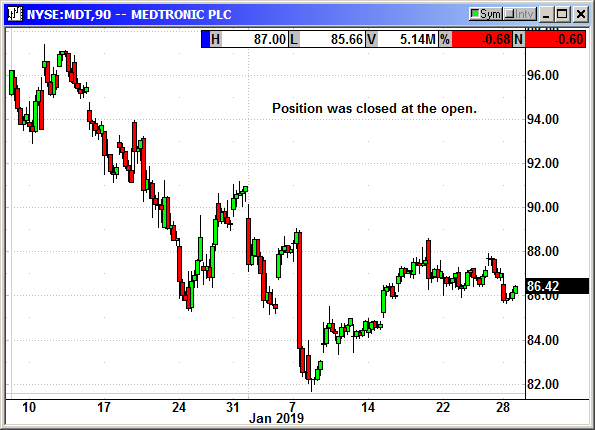 Medtronic tanked after the JP Morgan Conference after the CEO updated guidance and some analysts took it negatively. The company lowered 2019 guidance slightly due to worries over paclitaxel and higher mortality signals. However, the company feels "very confident" the devices are safe and has the necessary data to back up the claim. An analyst at BTIG said the guidance was "very conservative" after talking to the CEO. He said Medtronic should be able to at the very least match its guidance and more than likely beat it. BTIG said beyond 2019 the company has a "broad and rich" pipeline for fiscal 2020 that will generate more than a 4% growth in several specific areas. He upgraded MDT shares from neutral to buy with a $100 price target. On Tuesday Medtronic announced a new mobile app that communicates directly with its portfolio of pacemakers. Patients and doctors can monitor the pacemakers on a smartphone or tablet. That means the pacemaker can transmit vital data to the patients smartphone without intervention and the app can communicate with the doctor for analysis. Patients no longer need to be tied to home based monitoring equipment. Shares rallied the last two days on the new mobile app news and the analyst upgrade. I am recommending a May option because there are no March or April options at this time. We can buy time, but we do not have to use it. Closed 1/28: Long May $90 call @ $2.82, exit $2.28, -.54 loss.